We communicate for many different reasons. We want someone to understand how we feel, to share both positive and negative experiences or to express anger and frustration. Our words include both the content of what we say as well as our feelings. To understand the content, we have to listen to the facts. To understand the feelings, we have to listen for the choice of words, the tone of the voice and observe the person’s body language. The more information you have, the greater chance of understanding the other person. Here are some steps that will help you improve the dance. 1. Concerned Silence– Many of us are uncomfortable with silence and often feel like we must fill in the space. As they say, silence is golden. Give the other person the time they need even if there is some empty space. You can maintain eye contact, lean forward or if appropriate hold their hand. When you rush to say something because you are anxious, it often does not help the flow or rhythm of the conversation. 2. Encouragement – If the topic is difficult, often people need to know that you are interested and willing to listen. Try- “ I ‘d like to hear more “ or, “If you would like to share that with me, I would be glad to listen”. This can be really helpful if the dance gets stalled or stuck. 3 Prompters – It can be helpful to let the other person know that you really are listening to them and trying to understand, accept, and care about what they are telling you. A short phrase- “ Aha” or “ I see” can help them continue without interrupting them. 4. 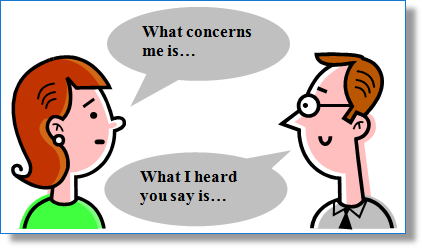 Restatement – It can be helpful to feed back what you have heard or what you think you have heard. Someone says, “ I am really tired of all these doctor visits”. You could say, “ It’s tough having so much of your day spent going to appointments”. This helps the person know you understand the message and their feelings. 5. Reflection – Take what the other person has said and put it into your own words. A person may say, “ I’m afraid I will never be well again”. You might respond with , “ That’s a real concern for you now”. This tool helps to clarify the message and give the other person a chance to correct you if you have not correctly heard what they are saying. 6. Leading statement or question – When someone is trying to solve a problem, it can be helpful to ask them, “What are some of the things you have thought of to do or say?” If said with true concern, it can encourage the other person to come up with some options for the problem. As there are ways to improve the dance of communication, there are also ways to end the dance. Be aware of when you make these moves so that you can retrace your steps. 1. Negators – A great way to send the message that what the other person is saying is not important is “ don’t worry or that’s silly”. You are basically telling the other person that what they feel is wrong and not worth your time. You do not have to agree with what everyone is always saying, but when we judge other’s feelings, the ability to talk about the content gets stalled. 2. Accusers – To say to someone,” You really don’t mean that” says to them that what they feel is wrong and you do not want to continue the conversation. 3. Assumers- If you have not experienced what the other person is going through, it is best not to say, “ I know how you feel”. If you have had a similar experience, then it may be helpful to say, “ I have had the same operation, etc.”. Don’t assume that you know how someone else is feeling, no matter how well you think you know them or their situation. 4. Directives – Telling someone, “ You should or you shouldn’t” takes the responsibility for decision- making away from them and places the control with you. It implies that you know what is better for them than they do. This is not a caring or helpful way to support someone. 5. Clichés – When someone we care about is hurting, we often want to reassure them. Saying “ Everything will be all right” is usually what we say when we don’t know what to say and feel compelled to say something. Hand holding or just supportive silence is a better option. 6. Value judging – Saying,”Oh no, or “That’s awful” are only helpful if your feelings about the situation are the same as the other person’s feelings. It’s not easy to have smooth easy flowing conversation when the content is hard, painful or frightening. Remembering some of these steps will help keep the dance moving in a supportive loving direction.